There are a lot of reasons to like Altria. The products are branded and addictive and the market for tobacco products so far is in the hands of a few major players with Altria holding a dominant position. There is some threat of future legislation banning the sale of tobacco products or making it uneconomical. However, local governments take in a ton of money by heavily taxing tobacco products. It is hard to find another scapegoat that can be taxed so heavily. The other factor to consider is that while the number of smokers is expected to be decreasing over time, so far the increase in prices has more than offset the drop in consumers. At some point, this could reverse, but this has been the fear for several decades now. So far, price increases have more than offset volume declines, which results in growing net income year over time. Future growth in earnings will also be driven by productivity improvements, as well as strategic acquisitions and new product developments. Share buybacks are another tool that could increase earnings per share over time. As an owner of a 10% stake in Anheuser - Busch Inbev (BUD), Altria's fortunes are also tied to the performance of this entity. The decrease in the US corporate income tax rate this year will provide a permanent boost to earnings per share for Altria, for as long as those lower tax rates are kept. 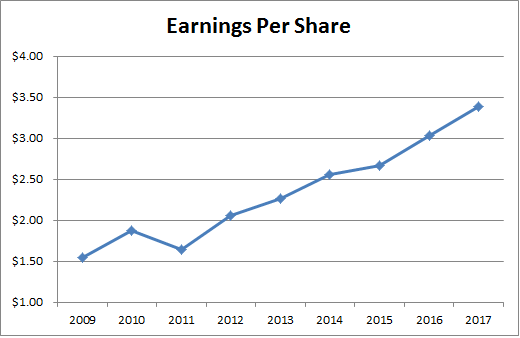 Since 2009, the company has managed to boost its earnings from $1.54/share in 2009 to $3.39/share in 2017. Altria is projecting to earn somewhere in a range of $3.90 to $4.03/share. On a side note, the earnings for 2017 and 2016 have been adjusted for one time accounting items. The process is explained in this article. 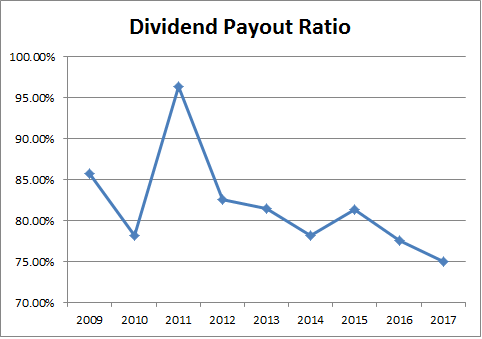 The dividend payout ratio has decreased slightly to 75% in 2017, from 85% in 2009. 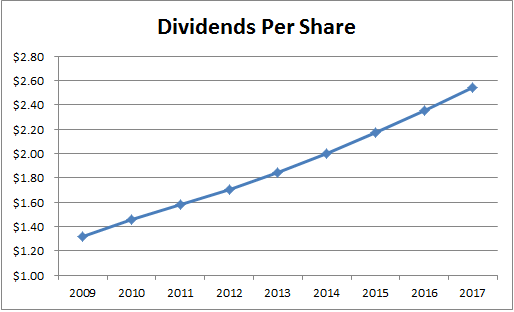 I believe that the dividend is safe, because the business model is stable, and the company has been able to grow earnings per share despite distributing almost everything back to shareholders in the form of dividends. There are very few companies in the world which can distribute most of their profits to shareholders in the form of dividends, and still manage to grow the bottom line. It is great to be in a position to earn more than you know what to do with. The opportunities for top-line growth are limited, and the company already has a solid competitive position. Both Altria, and its competitors have limitations on advertising their products, which means more money for dividends and even share buybacks. The company has been rewarding its investors richly for decades. However, you should not have too much of your portfolio in tobacco companies, simply in order to be smart and make sure your portfolio can endure any regulatory shock that can be devastating to the industry as a whole. A big risk could be the introduction of plain packaging, which would essentially wipe out any brand associations. Competition from E-cigarettes and vapor products could also jeopardize the level of sales for traditional tobacco products that deliver high margins for the likes of Altria. Last but not least, a larger and unnoticed threat is the possibility for mass adoption of electric cars in the future. Half of tobacco sales occur at gas stations, which is why anything that affects visits to gas stations could hurt cigarette sales. For an article outlining the risks for tobacco companies in general, check this one. While Altria is one of the best performing US companies for its investors, we should not forget that past performance is not a perfect roadmap for the future. That being said, it will likely be a core holding for many dividend growth portfolios for a while. Right now, I find the stock to be attractively valued at 16 times forward earnings and a dividend yield of 4.50%. - Are you ignoring investment risks you know about?